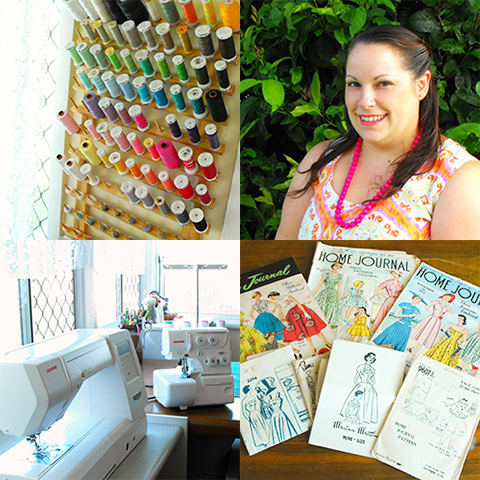 My name is Tina and my little family and I live in Rockhampton QLD, where I run my handmade clothing business from home. My husband Greg and I were High School sweethearts and have spent almost half our lives together. We have 2 amazing little children. Our son Riley is almost 4 and our daughter Eliza just turned 2. Before embarking on my home business journey I was a retail manager and had no time at all for anything creative even though craft had been a large part of my younger life. After Riley was born I started to sew again and found that it was a great way to relax while he napped beside me. I love being able to mix my love of retail and my passion of creating beautiful clothing, all while enjoying my little ones' first years. I sew vintage style clothing for babies, children and women. Bold colourful cottons are among my favourite fabrics to work with for ladies and girls wear, but I am also a lover of delicate, romantic prints teamed with lace and beautiful trims. For the boys, I can't go past stripes, plaids and retro prints mixed with the texture of beautiful linens and wool blends for the perfect vintage modern look. My name is Tina and I am a vintage pattern addict! I am luck to have so many vintage sewing patterns from the 40s, 50s, 60s and even the 70s and 80s that continually give me inspiration. If you follow me on Pinterest you will see just how in love I am with the 50s and 60s especially! I have always loved to be creative and learned to hand sew simple items from a very young age. I taught myself how to read clothing patterns and soon found myself experimenting with different fabrics and altering patterns for my needs. When I first started out I was making quilts and other similar items, so using my name as the business name just made sense to me. Quilts are the kinds of things that are passed down through the generations, so having the maker's name on them is very important. After I began making clothing the name had already stuck. It's who I am! Every item I make is a little piece of me. I am an active member of lots of business building groups on Facebook where I get lots of helpful tips and info, and I have taken a few online classes on selling online to complement my bricks and mortar retail business background. But my favourite resource is Google! If I want to know more about something I Google. I spend at least an hour of every day researching and learning what I need to make the most of my business. This is not easy, you need to work hard every day and not give up. Make sure you set yourself goals and know what direction you want to head in. Scream from the rooftops and be proud of what you do! Make sure that you are showing the world the best you can be with amazing photos, a cohesive brand, fantastic customer service and a positive attitude. Seize every opportunity you are offered, even if you think you aren't ready. If you don't enjoy what you are doing you will never be happy. Do something you love and you will never work a day of your life. I enjoy working in my veggie garden and love to escape into a good novel. A day with the family in the nearby rain forest exploring and swimming in the beautiful freshwater streams. Addicted to Buttons - Amazing, unique, high quality items from a very passionate seller.